Who really designed Ark: Survival Evolved? A lawsuit, filed late last year, alleges that there’s a messy story behind the development of one of Steam’s biggest hits. The players involved are Trendy Entertainment, the company behind Dungeon Defenders, and Studio Wildcard, the start-up game dev behind Ark, which launched in Early Access last year on both Steam and Xbox One. In a lawsuit filed against Wildcard in December of 2015, Trendy alleges that their former creative director, game designer Jeremy Stieglitz, breached his contract and has been secretly working on Ark since he resigned from his position in 2014. In court filings obtained by Kotaku this week, Trendy’s lawyers allege that Stieglitz had violated contractual agreements not to compete with his former company and “not to solicit Trendy employees.” They also accuse Wildcard of “tortious interference” with those contractual agreements, claiming that these acts “have had a devastating impact on Trendy’s business” and arguing that Ark is directly competing with Dungeon Defenders both for players and developer talent. The lawsuit, which is ongoing, is filled with allegations about Stieglitz and his involvement with Ark: Survival Evolved. Wildcard’s leadership has denied that Stieglitz played a major role in the game’s creation, but Trendy argues otherwise, and they’ve filed for “injunctive relief and damages” in the Eighth Judicial Circuit of Florida. On April 27, the court will hear arguments on Trendy’s most recent motion, which asks for a temporary injunction until the case is settled. 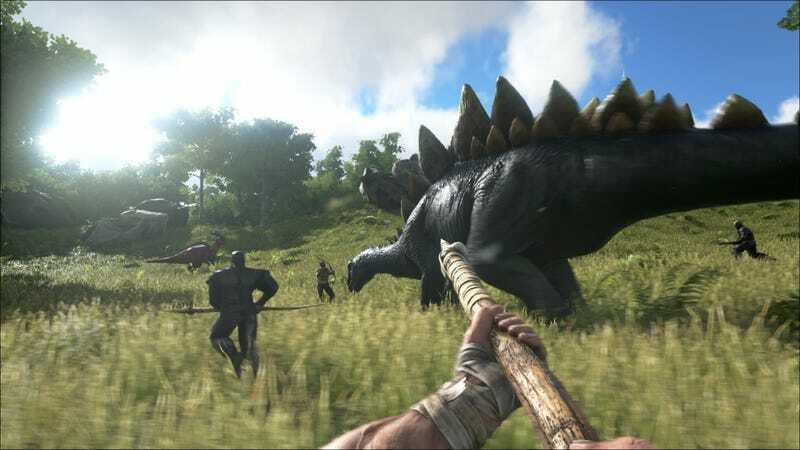 If granted, the injunction could temporarily halt development on Ark: Survival Evolved and even force Wildcard to pull the game from Steam as the lawsuit continues. While Wildcard has not yet filed briefs in its own defense, the studio did ask the court to dismiss Trendy’s allegations, calling them “irrelevant, immaterial, impertinent, and scandalous.” The court has not yet responded to this motion for dismissal. Studio Wildcard co-founder Jesse Rapczak told us last week during an interview at the Game Developers Conference in San Francisco that Stieglitz has “consulted” on Ark. Jeremy’s wife, Susan Stieglitz, is another co-founder of Wildcard. Stieglitz and Trendy have a controversial history, much of which is documented in the lawsuit. Three years ago, Trendy employees reached out to Kotaku to complain about working conditions at their studio. They said they were forced to work excessive overtime, to the tune of seven days a week, and they claimed they were too scared to complain. They were worried about retribution from their creative director, Stieglitz. In June 2013, we published an article about these claims. Stieglitz went on to suggest that either Trendy fire several people (whose names he listed in the e-mail) or find a way for him to seamlessly leave the company. He also asked if, as part of terms for an amicable departure, Trendy could lift the non-compete agreement he had signed as part of his original contract, which prevented him from engaging in “competitive activities” for three years after the termination of his employment. Eventually, they came to an arrangement. On June 23, 2014, Stieglitz signed paperwork that would tie him to Trendy for the next two months, until August 15. As part of this deal, which was also filed in the court documents, Trendy agreed to knock down the non-compete agreement from three years to one. It would have then ended in August of 2015. Stieglitz also agreed to offer a 20% interest on game development work for the next five years to Trendy’s investor, Insight, and to give them first right of refusal on the remainder of that interest. Trendy also alleges that the Stieglitz and Wildcard “misappropriated Trendy’s proprietary information, intellectual property and trade secrets for the development and launch of Ark: Survival Evolved,” specifically referring to technology that they allege Stieglitz developed while at Trendy and then later used for Ark: Survival Evolved. Much of Trendy’s case revolves around a single question that remains unanswered: Just how much of Ark: Survival Evolved is Jeremy Stieglitz’s work? Wildcard’s leadership has played down his role, telling Kotaku’s Nathan Grayson in an interview at GDC last week that Stieglitz has simply “consulted” on Ark, but that he would soon be joining the studio. The company behind Ark has not yet specifically addressed the allegations levied against them. Representatives for Wildcard declined to comment on this story, saying they couldn’t talk about ongoing litigation.